Before you purchase your promotional products, make sure you’re in touch with who your main demographic is. While it may be tempting to go for the trendiest item, not every trendy item will connect with your audience. For example, a water bottle with a built-in bluetooth speaker may be a hit for a 20-something gym buff, but will likely have less appeal for an audience that consists of people 60 and over. For the highest impact, always make sure you have your audience in mind. You might assume having a prominent business logo is key for promotional products, but that’s not always so! If you’re giving a gift to a long-time client, it may be better to give them something personalized with their name, while your business’s logo takes a backseat. You might consider a classy, executive pen or personalized drinkware like a copper moscow mule set. Not only will this be a much more heartfelt gift, but the recipient will be more likely to use it and tell others who gave it to them! Another reason to forgo having your logo front and center is to instead feature a witty, original slogan. This works especially well for t-shirts and reusable grocery bags. Not everyone will be comfortable wearing a large company logo, but if you minimize the size of the logo and make a slogan the focus (think Nike’s incredibly popular “Just Do It!” or go the punny route, e.g. “My Weekend is Booked!” for a bookseller), your promotional apparel will be more wearable and eye-catching. If your business has a strong social media presence, or you’re looking to grow your presence, prominently display your accounts on your promotional products under your logo. Keeping people in touch with your brand over social media is another effective way to build familiarity, so why not combine both marketing techniques with no extra effort! Your promotional products can work for your social media, and your social media can work for your promotional products! Social media giveaways are great ways to build engagement with your followers. For maximum engagement, consider doing giveaways no more often than once a month and with higher-ticket items like sweatshirts, an activity tracker wristband, or a quality tote bag. Promotional products always have a higher impact when they come in twos! Pens and notebooks are always a winning pair, or consider other themes like a gym bag and a sports bottle or sunglasses and a cooler. You can even give away two matching mugs for the recipient to share with a cup of coffee with a loved one, or so that they can give away one of the mugs to a friend, further spreading awareness of your brand with no extra work for you! According to research done by PPAI, as many as 81% of people keep promotional products for over a year, and 18% of overall recipients hold onto promotional products for over 11 years! With this is mind, it might be more strategic to have promotional products that can hold up for at least a couple years such as drinkware or pens, rather than something that has a limited lifespan like T-shirt. Even those who don’t treasure promotional products so dearly don’t often throw them out; PPAI also reports that 80% of those who don’t keep their promotional products give them away instead of throwing them out. It’s important to make sure your promotional products last! When at a trade show or when offering a reward for a referral, try offering multiple choices for your leads to pick from. This will encourage them to choose something they’ll actually make use of and hold onto for much longer than they might have otherwise. Don’t feel pressured to have a whole library of different products! Two or three choices is plenty and won’t risk overwhelming your potential clients or you! 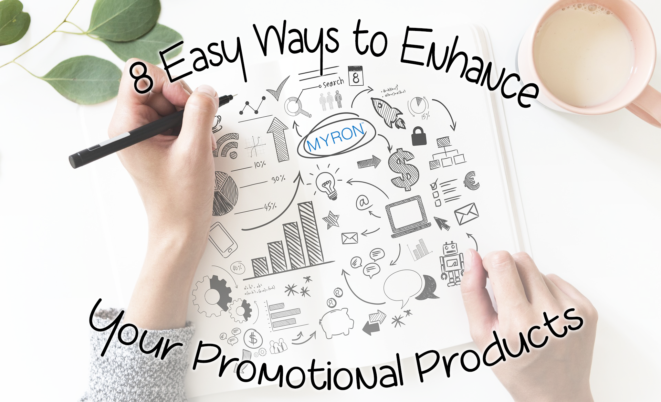 For more tips and an expansive catalogue of customizable promotional products, visit Myron. With a 100% satisfaction guarantee, we are sure to have the right products for your business!